DETERMINE NETTING WIDTH: To determine the needed width, measure the width of a single bay from the center of both posts. Then count the number of bays you want to cover and multiply the number of bays by the width of a single bay. This should give you the width needed for your application. For most standard pallet rack bays, one of our configurations will work. (ex: 6 bays wide with 99" centers. 6 bays x 99" = 594", or 49.5'. Utilize two 25' wide nets to meet this requirement.) If one of the standard rack netting kits does not equal that size, contact us. We can easily configure a solution that will fit perfectly. Important note: Do not cut nets to make them fit. They should be bunched. Cutting nets can reduce their capacity and endanger people. 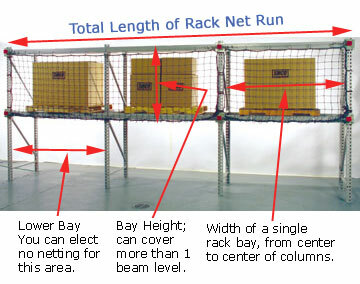 DETERMINE NETTING HEIGHT: Overall rack height is the starting dimension. If you want to guard pallets atop the highest beam, you need to know both the overall rack height and the height of a fully loaded pallet atop that beam. That number should align with the necessary net height, and you will need to purchase an extension mounting kit. If you don't want to cover pallets sitting on the floor, then you can measure from the bottom of the first beam level of stored pallets to the top of the pallet load on the highest beam level. MOUNTING KIT: All pre-engineered pallet rack safety nets must be fitted with a Mounting Kit for each net in the run. MORE INFORMATION: Rack mounting style options. If your pallet or load protrudes past the back of the racking, utilize an offset mounting kit, which acts to position the netting off the back of the racking to a maximum of 13”. This option can give you room to position pallets without pushing on the safety netting. You can choose from flush mount kits that attach the netting directly to the back of the rack so that items cannot fall from pallets flush against the netting. You can also order extension mounting kits that extend the height of your netting above the top beam of your pallet rack frame. Extension mount kits are available in both offset and flush mount configurations. Each pallet rack safety net is hung by its own hardware kit. One hardware kit must be ordered for the first net utilized, and an adder for each additional net. Utilize add-on kits for all nets other than the first one in a continuous row. (ex: for a 6-bay, rack 99” wide per bay, order the appropriate size netting, one starter mounting kit, and one add-on mounting kit to cover the two-net wide configuration).